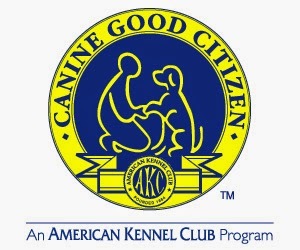 I mentioned last week that Jedi and I are working towards his AKC Canine Good Citizenship certification. This is a ten item test that is proving to be more difficult than it should be! Logan took it and passed with flying colors. 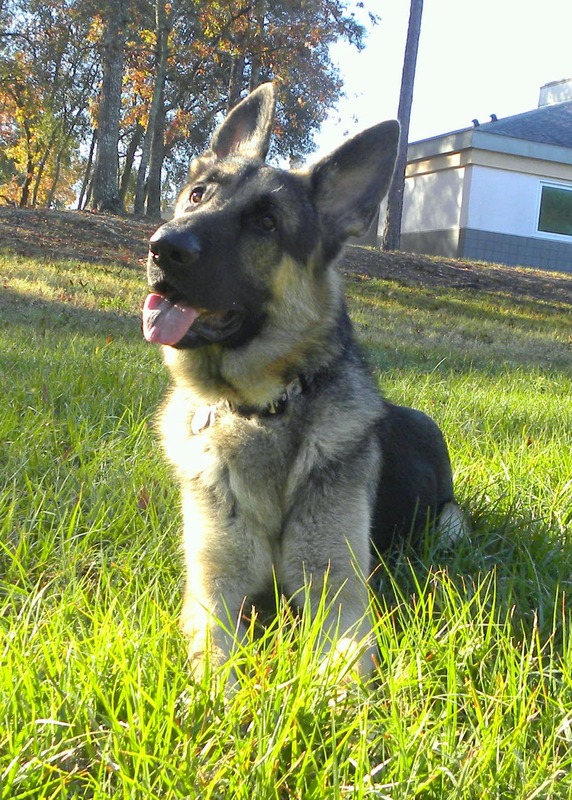 He was a very easy going, good natured dog that knew how to walk nicely on a leash. Jedi, not so much. If you aren't familiar with the CGC, here's a brief summary of the 10 test items. For more details look on the AKC website here. Accept a friendly stranger. While sitting, the dog allows a friendly stranger to approach the handler. The dog must not show resentment or shyness. Sitting politely for petting. The dog must sit for the test to begin. The dog allows a friendly stranger to touch it without showing shyness or resentment. Appearance and grooming. This one also starts with a sit. Dog allows the evaluator to brush/comb him as well as examine his ears and feet. Walk on a loose leash. The dog and handler make a series of turns and stops at the evaluator's command. Dog must walk on a loose leash the entire time. Walk through a crowd. Dog and handler walk around and closely pass by several people. Dog must be calm without showing any shyness or resentment. Sit/down and stay on command. The dog must sit or lie down and stay in position for an extended period of time. Come when called. The handler puts dog in a sit then walks 10 feet from the dog, turns and call the dog. Dog must come when called. Favorable reaction to another dog. Two handlers and their dogs approach each other from a distance, and stop to shake hands and exchange pleasantries before continuing on. Dogs should remain calm and ignore both the other handler and dog. Favorable reaction to distraction. The evaluator will set up a series of distractions both physical and auditory. (passing by on crutches or in a wheelchair, opening an umbrella, dropping a metal dog food dish, etc.) The dog should not panic, try to run away or show aggressiveness. Supervised separation. The handler leaves her dog with a trusted person and walks out of the dog's line of sight for three minutes. The dog must remain calm until the owner returns. "How many times are we going to sit?" As you can see, there's a lot of sitting. 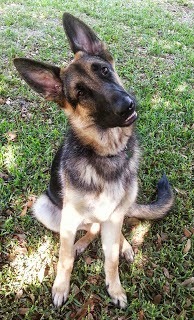 Jedi knows how to sit, but gets tired of doing it all the time. I guess he just doesn't see the purpose behind it -- and I don't know how to explain it to him either. There's also a lot of loose leash walking. I know that Jedi knows how to walk on a loose leash as well -- I've seen him do it! -- he just chooses not to do it when people are looking. He gets excited and pulls. Or he smells were something else has peed and pulls. Or he feels that we should be going in a different direction -- and he pulls. See a pattern? I'm glad that we're taking a CGC prep class. I'm hoping that'll help. The class -- as well as the test -- is being held at the Humane Society after hours. The Humane Society is right next to a major road. All during class we can hear cars zooming by as well as ambulances on their way to the hospital only a few miles to the west. Unfortunately, that's not the only distraction. Thousands of dogs come through the Humane Society every year. Even if only 10% of them left their mark that's still a lot of pee mail to compete with. The Humane Society also has a feral cat colony living on the property. These cats aren't afraid of dogs and like to come out during class to see what's going on. There are seven dog/handler teams taking the class, and it's a wonder any of us can get our dogs' attention. "Wouldn't you rather play ball?" Last Wednesday was our first class with the dogs. Except maybe for a very stately golden retriever, all of the dogs were idiots. I was near tears when I got home. Did I just waste a $100? The head trainer is breaking the test up into tiny pieces. Last week we worked on test items 1, 2 and 3. Jedi has decided that he doesn't like having his ears touched anymore. Great. There goes test item number 3! We also worked on test items 4, 6 and 10. He would have failed the loose leash walking part of item 4. On a happier note, he killed the down stay (item 6). And when we practiced item 10, we got a full minute before he became anxious. Our next class is tomorrow night. I hope it goes better. I've been practicing. I try to walk him a little bit every day, having him sit every 25 feet or so. (He gets annoyed pretty quickly.) And I've been taking Jedi to strange places. The Humane Society's thrift store allows dogs. That was definitely a challenge for him! I also took him to the Humane Society during the day, hoping to get him used to the smells so maybe next time won't be so overwhelming.